The Conduit Mead. The property belonging to the City of London surveyed 1794.
bl.uk > Online Gallery Home	> Online exhibitions	> Crace Collection of Maps of London	> The Conduit Mead. The property belonging to the City of London surveyed 1794. 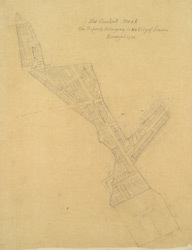 This is a 19th-century tracing of a 1794 survey of properties belonging to the Corporation of London in New Bond Street, Conduit Street, South Molton Street and Stratford Place, Mayfair.